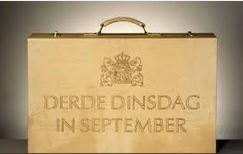 Its the third Tuesday in September; and in the Hague it can mean only one thing, Prinsjesdag! The Dutch don’t really go in for pomp and ceremony, but this event is on a golden Dutch tradition. The king moves from Palais Noordeinde to the Ridderzaal at the Binnenhof in a golden coach. He delivers the Troonrede or annual speech to parliament then returns to his palace to appear to the populace on the balcony. It is a tradition going back 200 years, and is watched live on TV by much of the population who cannot visit the Hague in person. It reminds me of the day a couple of years ago when I was invited to speak at a certain world renowned NGO in The Hague. At lunchtime 12:30 to be precise, exactly 30 minutes before His Majesty left the palace, and when security was at its tightest. Of course as an NGO: the hundreds of people employed there are not involved in Dutch tradition, and must not be involved in any way with Dutch domestic politics. So when setting the date, no one had considered that the minor inconvenience of a state procession might affect the traffic. I realised it could be a bad day to travel. I set off for the venue extra early, armed with my notes and ID (I had had to mail my presentation on ahead to de scanned for bugs). As I travelled down the A4 and then the A44 the traffic news advised avoiding The Hague – but I pushed on regardless. Wassenaaar was the worst, as all traffic lights were on red to allow the security cavalcade escorting the King to race towards the city centre and his rendevous with the golden coach. “its the Prinsjesdag procession” I told them – to be met with blank looks. My presentation started, surrounded by flags from many nations, and with a bigger audience than I had ever dealt with, I talked for 30 minutes, and held a question and answer session after. I have to say I really enjoyed the experience, and was presented with a lovely bouquet of flowers as a thank you after. But I left quietly, slipping through the aftermath of the city pagentry, and as I went I wondered how King Willlem Alexander was feeling after his day was over, the first King ever to ride in the golden coach build originally for Queen Willemina, and used by Queen Juliana and Queen Beatrix. A pity, I think, that many of the people at the world famous NGO had not known that.